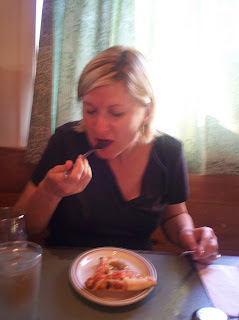 Lately in my neck of the woods (Portland, ME), we have been acquiring MANY new pizza joints. Some are good, some aren't so good, and some I haven't tried yet cause I get tired of trying out all these damn pizza places! And why try out more places when you already know where the best is at? One of our favorites is Micucci's (you will be hearing more about them in the future), and the other is this week's spotlight: Bonobo Wood Fired Pizza. When we moved here, we took our time discovering our West End neighborhood. There are some deli's, markets, bars and a couple of lovely restaurants - one of them being Bonobo. The first thing I remember was smelling the wood burning oven. Wood fire is one of those smells that is hard not to love, especially in the winter time. It's warm, inviting and whatever is cooking has got to taste great! 3) Did I mention wood fired pizzas? The most recent time we dined, we had a very special guest with us. Eric's mother, Brigitte was visiting all the way from Iraq. Every time she comes home for a visit we eat there, because it is her favorite. And this outing was just as wonderful as any! Let me start off by telling you how awesome their salads are. So ridiculously simple and delicious! Their greens are always fresh and crisp, never soggy or limp. We started off with the House Salad with a wedge of Brie. 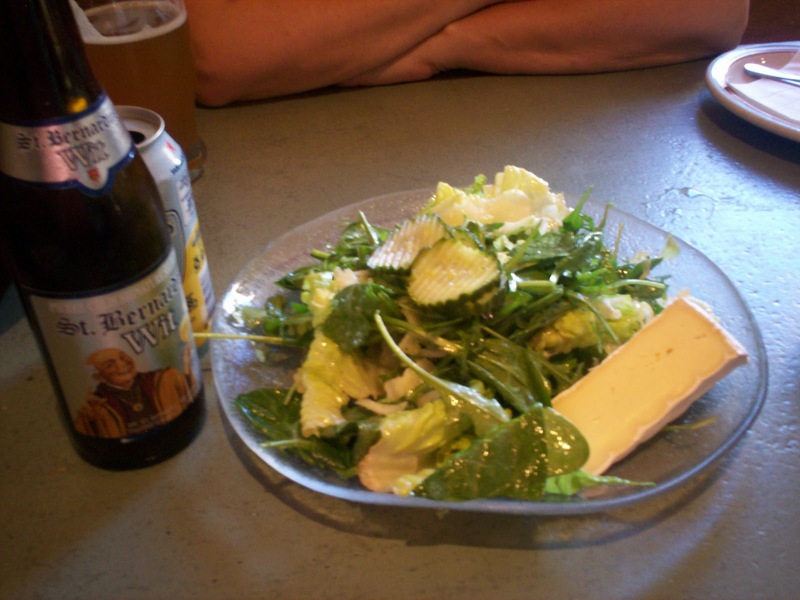 Just romaine, spinach and endive with pickled cucumbers and their own vinagrette. 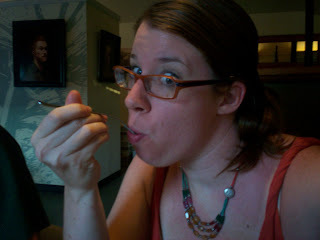 We've also tried their Caesar Salad which is equally amazing. 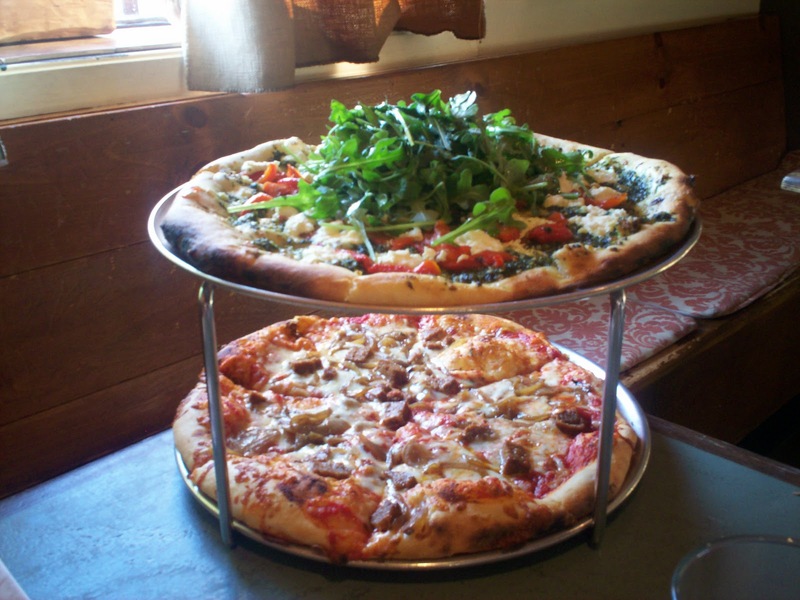 When deciding on pizza, we narrowed it down to having one meat and one veggie pie. Oh, but which to choose?!? I've never been disappointed by any of them! We went with the Baby Arugula (arugula almond pesto, roasted red peppers, goat cheese and a baby arugula salad on top), and The Farm (pork sausage, roasted onions, mozzarella, oregano and red sauce). What a fantastic team these two were! One is fresh and bright and the other is smoky and hearty. Both were flavorful and crisp. And then on to my favorite part...dessert! 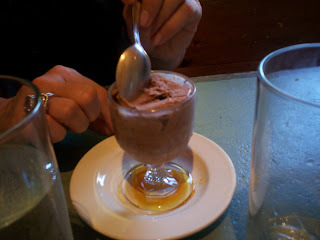 The first time we dined here, Eric and I were with friends and tasted every selection. All of them are simple and decadent. A variety of different flavors of gelato (provided by Gelato Fiasco), creme brulee, and my favorite Tiramisu! I can not resist this perfect way to end a perfect meal! 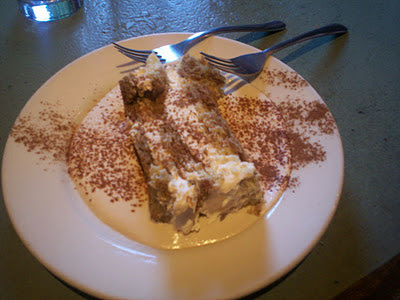 I've always said it's the best Tiramisu I've had in a long time and I'm not lying. It's not too boozy, not too sweet and not too heavy, just delightful! One thing I love about this place is that when it's time for dessert, you don't feel too full to eat it. Coming from the restaurant industry and especially the dessert end of it, often times portion sizes are just too big to even think about eating a sweet treat at the end of the meal. A very frustrating thing when you're the dessert maker! But they really get the portion sizes right here. Whether you want dessert or not, you don't leave feeling like your ready to give birth to a food baby. Whenever we have guests visiting us, Bonobo is where we always take them, and Eric's mother is no exception to the rule. She says, "I've had pizza all over the world, this is the best!" Now that's saying something. She is truly a world traveler, a lover of life and new experiences. Can't wait till her next trip home! Join us next week for another adventure in BabyStella's kitchen!